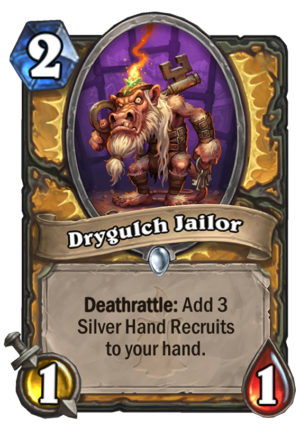 Drygulch Jailor is a 2 Mana Cost Common Paladin Minion card from the Kobolds and Catacombs set! On the surface this card looks really bad – not only because Kobolds are not surface dwellers and prefer dungeons, but also because it’s just so slow. We have to be realistic – this is one of Hearthstone’s worst cards that you can play. The body is extremely weak, it costs way too much and it’s effect is behind a Deathrattle! However, we have to also be fair to the card – there is a reason this effect is gated so heavily that you would barely consider playing it, if at all. First off, Silver Hand Recruits do things. They have many synergies, starting from the obvious Lightfused Stegodon and Quartermaster (Wild), to things that care about 1/1s, such as Steward of Darkshire and Hobgoblin (Wild). 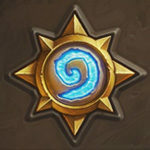 While we are not currently seeing competitive Paladin decks in Standard that are not Murloc Paladin, we have to recognize that “Dude Paladin” is considered one of the best Wild decks at the moment. 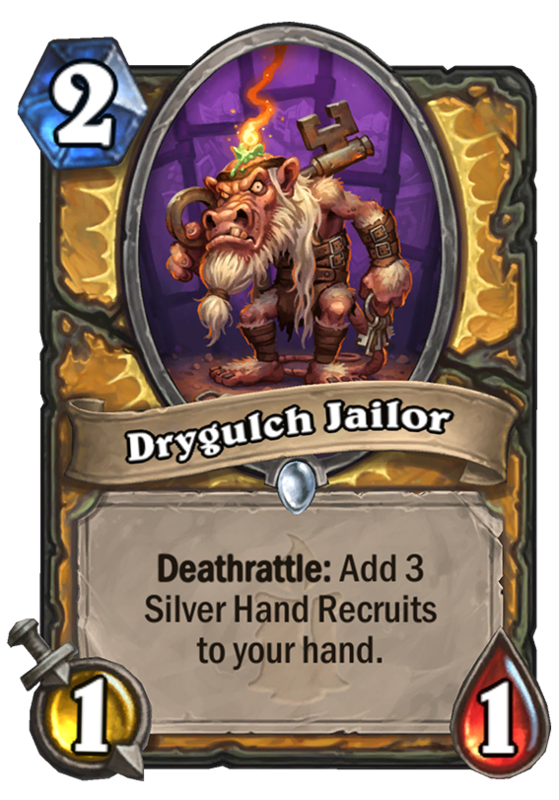 It has managed to reach a critical mass of synergistic cards that work off one another and while the power level of Drygulch Jailor is not up there with the Ultimate Infestations of Hearthstone, it adds to that Silver Hand Recruit-matters theme in its own way. Another thing that it does is work well with is the handbuff mechanic from Mean Streets of Gadgetzan. It’s doubtful whether 1 mana 1/1s are exactly what you want to be buffing, given that after investing in playing handbuffs they become 1 mana 2/2s or 3/3s approaching the mid- to late-game… yay. Still, it’s something that can happen and just about any way you can extract value from the Jailor makes it somewhat scary because at the end of the day, it does generate a lot of extra cards for you to play. 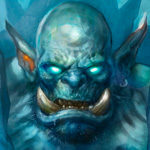 Keep in mind that, even if they didn’t do anything, those recruits are three more cards in your hand that you can now suddenly do things with – activating from “whenever a minion is summoned” to “when you play a card” effects and abilities, having those extra cheap resources could be very useful. 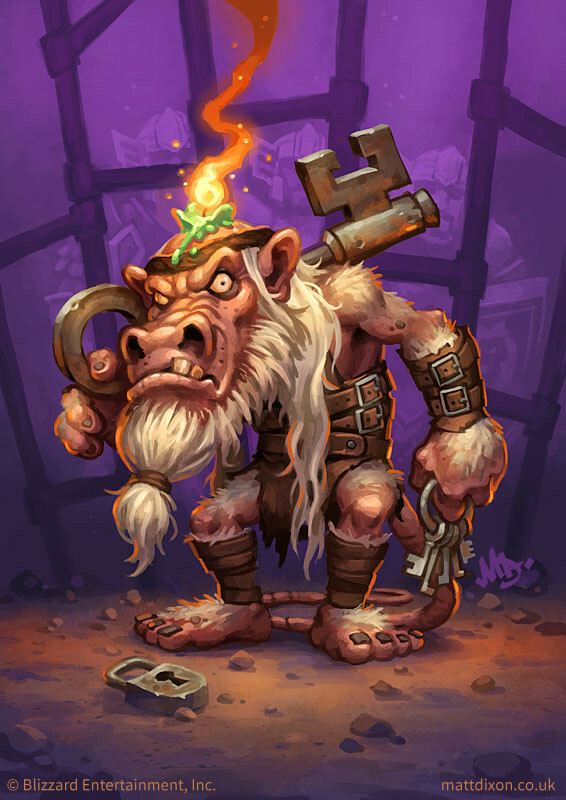 Imagine a Highlander Priest using Potion of Madness on Drygulch Jailor – well, they have taken one of Hearthstone’s weakest cards and are now going to kill you with it. If any similar effect becomes available to Paladin, this could turn out to be a playable constructed card, especially if an Auctionmaster Beardo-like effect comes along, but one that cares about minions – suddenly you realize that three 1-cost dudes is exactly the amount necessary to summon all four Horsemen of the Apocalypse. Despite all that, it’s unlikely for the Drygulch Jailor to see the light of day. It simply feels like a card that was made because they couldn’t miss the opportunity to make Silver Hand Recruits for the Recruit set and all of that sweet potential is locked behind some heavily locked doors. This minion does not trade with anything in its mana cost range and thus does not impact the board in any way, which is a very important quality for a 2-cost minion to have. LoL.Dude Paladin in 2018 standard and it’s top tier. A classic example of public viewing card in arena way. Even Level Up see play. 5 Star for design! I like support cards for existing archetypes that are too weak to see play and are combo orientated. I, Sean Stewart, am actually really fond of this card. People are writing it off before we see beyond 15 cards from this set. It may seem weak initially, but I play a silver hand deck in standard, and losing stand against darkness and steward of darkshire, this really could help. Why I’m concerned about is that they’ll neglect to add more synergistic cards to the set, but with this being the single card we’ve seen from paladin, I’m excited to see the fact that they’re encouraging more decks and diversifying the meta. This card is useful for when you don’t have a great opening hand: if you get this, you’ll at least have a few more cards to use in the next few turns… keep in mind I’m a rank 19 scrub, so I’m no master strategist. I moved to Wild about a month ago because I miss playing a full Silverhand deck and other cards “cough, RAGNOROS”. This card is great because, like you said, it helps against removal by keeping your hand full and with hand buff can make it annoying to deal with. Also playing these out after Steward of Darkshire with them being buffed in hard or getting buff next turn with Rallying Blade if great for any temo loss due to removal. Handbuff. Or back to your homes. Or any kind of token strategy. Everyone is bashing on this card but wait for the rest of the expansion. I’m sure there’s gonna be more silver hand recruit synergies released. Remember that this is part of the initial spoilers so they’re probably just hinting at cards they haven’t released yet. Also wild is a thing and 90% of Paladins I see there play Silverhand decks usually. Does not even matter if its Ranked or Casual. I see 9 our of 10 Paladins playing Silverhand decks. I honestly like this. Yeah I got top 50 in wild last month and most of the paladins i played were just tempo lists and the only silver hand synergies they ran were, occasionally in the greedier versions, quartermaster. But i do aggree that this could push for a more silver hand focused paladin deck to be viable in wild but not alone. Now, I struggle to find the reason why this card exists – it’s boring, it only has mediocre synergy with quite weak decks – yes, it works with handbuff and REcruit synergies in Wild – but ultimately it’s way too weak to play in either aggro or control. Think of it this way – it’s a hero power that makes your next 3 hero powers cost 1 less and be re-usable for its normal cost. Why would any deck want to use their hero power is beyond me, as it is counterproductive in aggro, and meaningless in control. Sadly, this card is a waste of a slot. No, if you play Wild you can utilize the power of silver hand recruits. I’ve over 90% win percentage with this kind of deck, with over 60 games played. This archetype is not bad at all. Not sure if this card would make it in the deck thoug, but it’s worth a shot. 1 star. It’s comparable to Igneous Elemental. If you put all the stats together, Igneous Elemental is a 5 Mana 4-7, while this is a 5 Mana 4-4. The only way this sees play is if more Silver Hand Recruit synergy cards come out. Seems pretty terrible, if it was 2/1 body, it would be comparable to loot hoarder and playable. I dont really see much synergy with Silver hand recruits except the adapt beast and tarim which doesn’t seem enough. Handbuff is too weak with this because youd rather play firefly/igneous elemental.